The Echinoblog: What Good Are Echinoderms? Pt. 2! Biotechnology! "Other than evolution, ecology, paleontology, genetics, and marine biology, echinoderms aren't really good for anything are they?" *sigh* Several years ago, I wrote up something that answered the question "Echinoderms... So, what good are they??" Its been a few years and the question has once again reared its ugly head. Plus, its always good to re-visit the directions that research may take you..
And so I thought I would present how echinoderms have found their way into several important uses/functions in the rapidly growing field of biotechnology! Information below was inspired by two papers! This one by C. Petzelt (Are Echinoderms of Interest to Biotechnology?) which you can find on Google books here. and this paper by Micael et al. (2009) on Exploitation and Conservation of Echinoderms. There is currently a substantial effort to discover marine biodiversity that may serve as sources for anti-cancer, anti-AIDS and other disease resistant medicines. There are big research programs, such as the one that was underway at the Coral Reef Research Foundation in Palau (in conjunction with the National Cancer Institute) to discover potentially important materials throughout tropical coral reefs and many other places throughout the world. One report from Mutee et al. 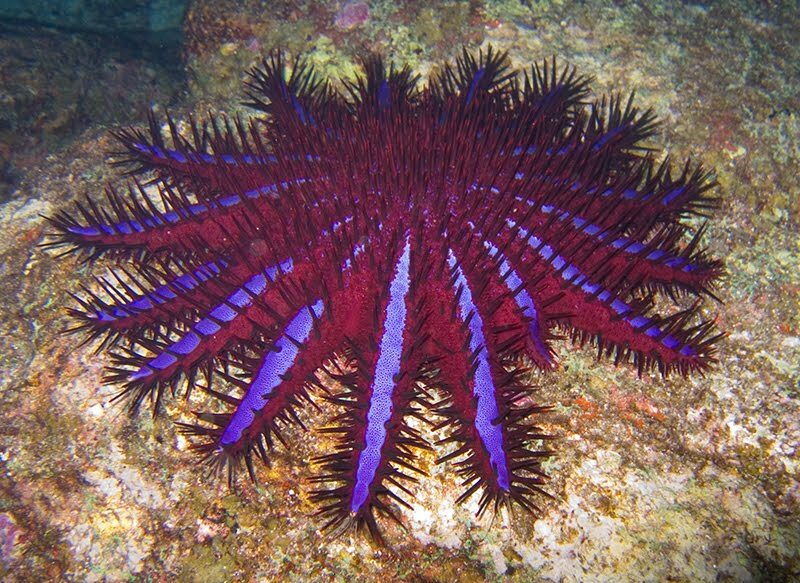 published this year in the African Journal of Pharmacy and Pharmacology claims to have found a valuable anti-cancer agent in what has been a reviled pest and predator of coral... Acanthaster planci the Crown of Thorns Starfish! Mutee and colleagues have found that an extract from the Crown of Thorns starfish inhibited cell growth and induced "cell death" (called apoptosis) in a breast cancer cell line. Apparently, this cell death effect was more potent and faster than the one created by tamoxifen (another well known anti-cancer agent). 2. Sources of anti-bacterial drugs. A 2002 paper in the Journal of Invertebrate Pathology by Haug et al. studied 3 different echinoderms from Norwegian waters for antibacterial properties! the sea cucumber Cucumaria frondosa.. Image from the National Museum of Ireland via Encyclopedia of Life! Image from SERPENT Media via the Encyclopedia of Life! 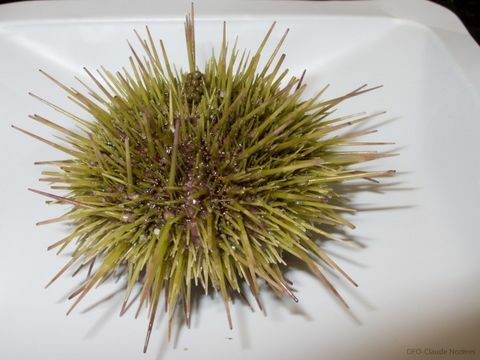 and the green sea urchin, Strongylocentrotus droebachiensis..
Haug and his team found that extracts from all 3 of these species made from the body wall and in the body cavity fluid, as well as eggs and gastrointestinal organs that all showed some antibacterial activity. 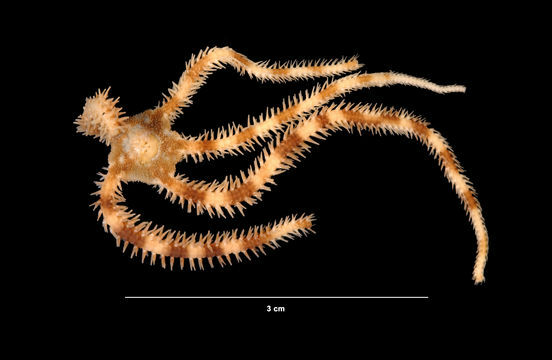 These weren't the first echinoderms to show antibacterial activity..with prior accounts showing brittle stars and sea cucumbers all displaying potential. Haug and other studies found that many echinoderms display very effective lysozyme activity. Lysozymes are special enzymes that attack the cell walls of bacteria. Naturally occurring lysozymes might play a role in the defensive responses of different species. Compounds within also showed the potential for hemolytic compounds which might be useful as blood thinning agents. Ultimately, there was a great potential for all of these -but especially the antibacterial compounds that, upon further refinement and purification might lead to potentially "novel antibiotics"! 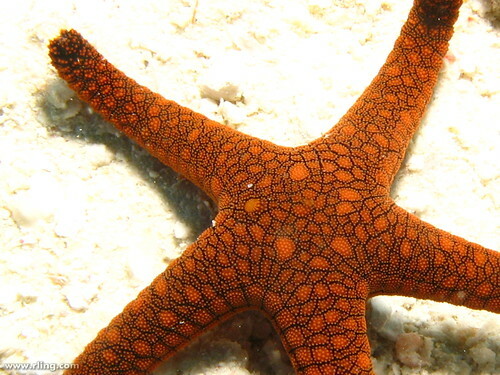 Have you ever noticed how starfish and other echinoderms can just kinda sit there-but NOTHING GROWS ON THEM?? You don't ever see algae, barnacles, sponges, or any other kind of "fouling" organisms that settle out and instantly begin colonizing bottom substrates. 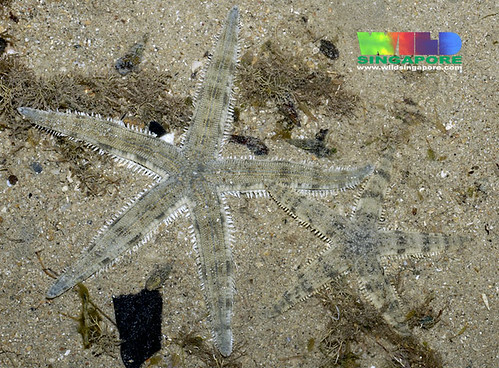 Many of their papers such as this one and this one have shown that chemicals produced by some sea stars may be one reason. 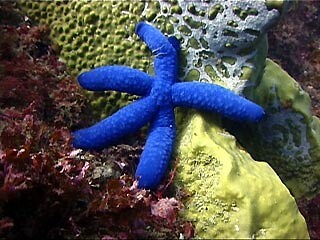 Some of their study animals included the common "Blue Linckia" aka Linckia laevigata found throughout the Indo-Pacific. And the so-called "fake Astropecten" Archaster typicus which occurs throughout the Indo-Pacific. 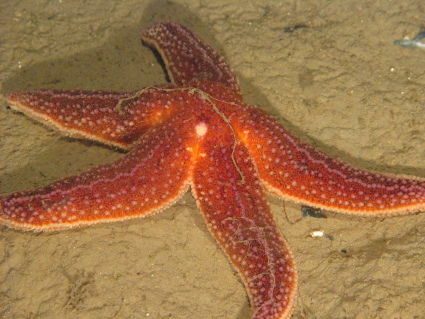 Guenther found from experiments that several chemicals, including hexadecanoic acid, cholesterol, lathosterol, and sitosterol were all extracted from individuals and used to prevent the settlement of diatoms on the sea star surfaces. The crystal "eyes" of Brittle Stars! This is actually an older discovery from a paper in Nature from 2001! (which you can read by clicking here). 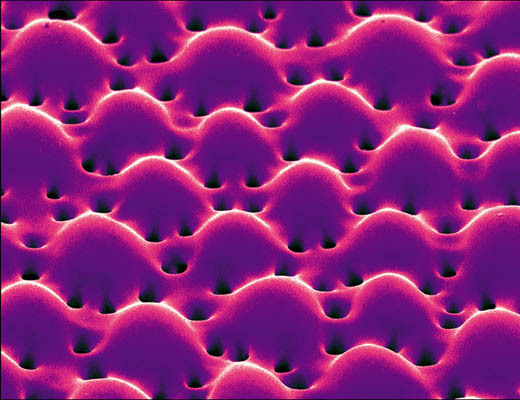 Aizenberg and her colleagues found that thousands of these lenses form a compound eye that covers the surface of the animal, resulting in "a functon similar to a digital camera that builds up the picture pixel by pixel". Bioluminesence in brittle stars and potential for other functions! click here to see one! 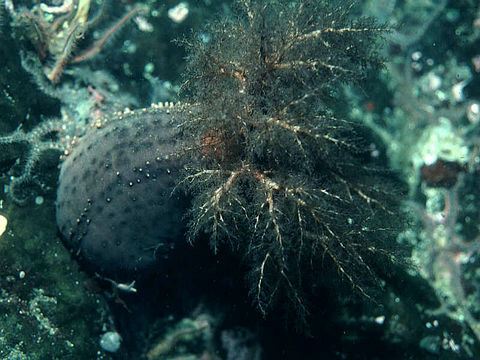 Several sources showed that sea cucumbers possessed fucosylated chondroitin sulphates (FucCS) that might be useful in a variety of bioactive ways including proliferation of blood vessels, preventing thrombosis in mammals, anticoagulants, anti-inflammatories, and possibly the treatment of cancer. Note that ALL of these applications had their roots in more fundamental parts of biology-ecology, evolution and systematics. Some of these bioactive compounds are used in defense. Or are part of the animal's own immune system. Labels: anti-cancer, biotechnology, drugs, usefulness, what good are echinoderms? Thank you for yet another inspiring and educational post! Your welcome! Always happy to hear positive feedback! Thank you. Thank you so much for this. I too have been pestered by similar questions over the years on why I plan to make my thesis on echinoderms. Best wishes for you!